Welcome to the East Tennessee Vocal Association! This page is for new teachers and new-to-East-Tennessee teachers who aren’t yet familiar with ETVA, how we operate, and how we can support your efforts in the classroom. Walk through the steps below to get oriented, and don’t be afraid to ask for help! First things first: become a member. The window for joining ETVA runs from July 1 through the first week in September, each year. The process is the same for new members and for returning members: click here to go to the registration form and fill it out. Returning members are expected to fill out the form each year to renew their membership. If you are a new teacher, you likely will not yet be a member of the National Association for Music Education (NAfME) or the Tennessee Music Educators Association (TMEA). Membership in NAfME and TMEA is required for ETVA members, but you won’t have to fill out separate registration forms in order to join them as well. We’ll use your ETVA registration information to process your NAfME and TMEA memberships for you. The email address you provide in the “Preferred Email” field will be used when we need to contact you directly (instead of using the blogging platform). After you’ve registered, you’ll receive an invoice for your ETVA, TMEA, and NAfME membership dues from us. You can expect this invoice in late August. You may also receive an invoice from NAfME, but please ignore that one. Check here for current-year fee information, and here for a schedule of expected invoices for planning purposes. If you are joining ETVA after the membership deadline (see the Calendar page for the membership deadline), you will be assessed a Late Membership Renewal Fine of $25. Second: subscribe to the ETVA newsfeeds. The Main ETVA Newsfeed. This newsfeed will contain information for the general membership, i.e., it’s for everyone. All ETVA members should subscribe to this newsfeed. 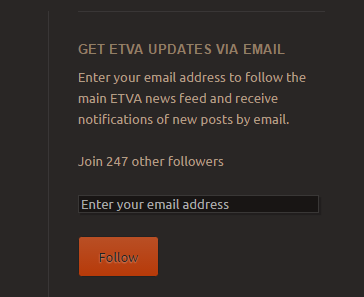 Enter your email address in the “GET ETVA UPDATES VIA EMAIL” field to subscribe. The HS ETVA Newsfeed. This newsfeed will contain information specifically for high school chorus teachers only. All ETVA members who teach high school should subscribe to this news feed. 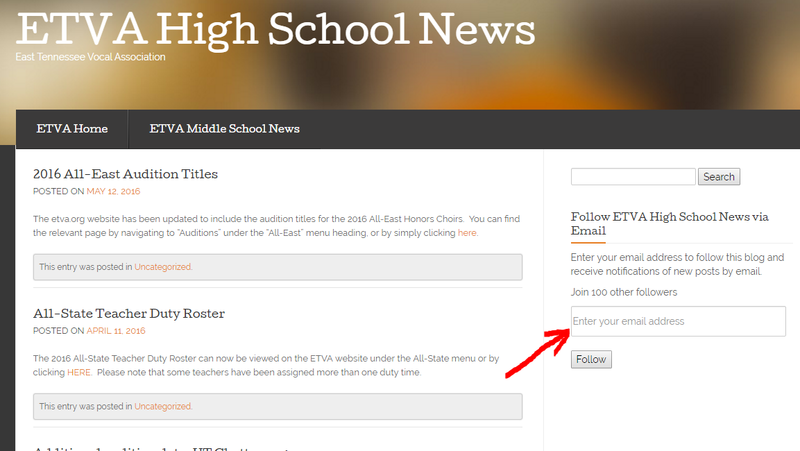 To subscribe, navigate to the HS News Page (click here to go directly to the page), and enter your email address in the “Follow ETVA High School News via Email” form on the right-hand side of the page. The MS ETVA Newsfeed. This newsfeed will contain information specifically for middle school chorus teachers only. All ETVA members who teach middle school should subscribe to this news feed. 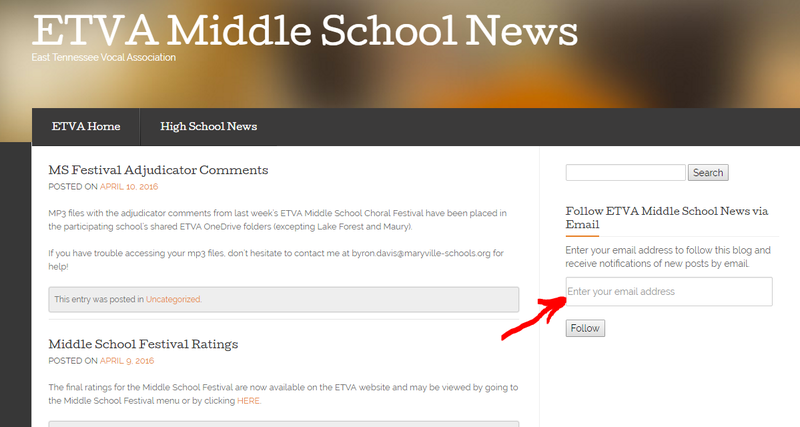 To subscribe, navigate to the MS News Page (click here to go directly to the page), and enter your email address in the “Follow ETVA Middle School News via Email” form on the right-hand side of the page. ETVA is organized into 3 regions: upper, middle, and lower. Generally, members who teach in counties surrounding Newport, Greeneville, and the Tri-Cities are in the upper region, members who teach in counties surrounding Knoxville are in the middle region, and members who teach in counties surrounding Chattanooga are in the lower region. Each ETVA region has an elected “Area Representative” who will be your first contact when you have questions about an ETVA event, policy, or expectation. To find your area rep, refer to the ETVA Officers page. You’ll find a current listing of reps with email addresses there. New members are strongly encouraged to contact their area reps and introduce themselves early in the academic year. These representatives will help you navigate your first year in the organization, but only if they know you’re out there! You’ll want to review the ETVA Calendar to see what events are happening and when the registration deadlines are. All-East. The All-East Tennessee Honors Choirs event is the major fall semester ETVA event. Your 10th-12th grade students are eligible to audition in September for a clinic/performance experience in November, and you can nominate your 9th grade students in October to participate in the Freshman Honors Choir. Becoming familiar with how All-East works is an early priority for new members, simply because 1) the registration deadline for auditions comes in early September, and 2) you’ll have to provide your candidates with copies of the audition music and mp3 files in time for them to prepare. Review the various pages under the “All East” menu heading, and ask your area rep for help! All-State. This event is managed at the state level by TMEA, but your students who participate in All-East are eligible to be selected for All-State. You’ll know which of your students qualify for All-State a couple of days after All-East is done. JB Lyle Choral Festival. The JB Lyle Choral Festival is the major spring semester ETVA event for high school ensembles. Your high school choral ensembles can participate in this adjudicated festival that takes place in either the last week in February or the first week in March. You’ll want to start looking at the JB Lyle pages under the “JB Lyle” menu heading before the holiday break so that you can start planning. All-East. The All-East Tennessee Honors Choirs event is the major fall semester ETVA event. You can nominate your 7th-grade and 8th-grade students in August to participate in the November All-East Middle School Honors Choirs. Becoming familiar with how All-East works is an early priority for new members, simply because the nomination deadline comes in early September. Review the various pages under the “All East” menu heading, and ask your area rep for help! Middle School Choral Festival. The Middle School Choral Festival is the major spring semester ETVA event for middle school ensembles. The MS Festival takes place in late March or early April, depending on the year. Check the MS Festival Policies for student eligibility.